I just love how Jacques says honAY; dessert's at about 18:10. This is a lo-res version of Simple Sweet Notes: Jacques Pépin: More Fast Food My Way (Episode 204) on YouTube. This post will probably offend someone. But, hey, it's my opinion and you can toss it in the digital bin if you don't like it. Plan on starting over, if not yearly, every other year. Make sure you have a good bee supplier. Be prepared to drone cull. Make sure you've got the tools you'll need to clear combs of bees and a sharp tool for cutting out comb. Or space in your freezer for a full comb. A paper bag will keep your food safely separated from the frozen dead bugs. Be prepared to kill queens on purpose, with your own hands. Read up on Fall requeening. Going treatment-free does not mean hands-off treatment. Those last two points are key to success IMO. We've hesitated to practice them, and that's why the every-other-year thing keeps happening to us. 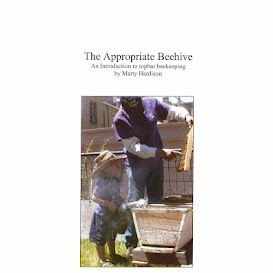 BTW, if you're starting up and are planning to breed a local survivor stock from your untreated bees, consider this. Since most hobbyists' hives are stocked with package bees from California, how do you think all the hives within 5 miles of your apiary will contribute to your efforts? A recent study in the San Diego area found that 13% of managed or commercial hives had Africanized genetic traits. Just some things to think about. These words apply just as well to beekeeping. Work some bees the "conventional" way and gain a thorough understanding of honeybee biology, varroa dynamics, and your local phenology. Using at least some conventional methods (e.g. : mite treatment using oxalic acid) will help you maintain momentum, so your knowledge builds rather than starts-and-stops. Once you understand how the biology, dynamics and phenology come into play, by all means go 100% treatment-free. Then if you successfully overwinter a colony two years in a row, you've earned the right to start playing with genetics. Don't forget that honeybees are not native to the US so creating the perfect bee is no small endeavor. While highly unlikely that you'll find a supplier of treatment-free bees, you can find one that's producing survivor stock so you're not starting from square one. Personally, I like Grampa's Ol' School Survivors but they only come on frames. Rather than going through the hassle of moving bees from frames into a TBH again, I want to give MAQS Formic Pro a try… once I figure how to use it in a Top Bar Hive.